Athens has begun repaying some €750mn in debt interest to its creditors, just days before deadline, but says it may default by next month if the liquidity issue is not resolved. Meanwhile a Eurogroup meeting, while optimistic, produced no new debt deal. Greece owes external creditors more than €320 billion, and is counting on a final €7.2 billion International Monetary Fund tranche, which has so far been suspended, to simply cover its daily salary and pension obligations, which amount to approximately €1.5 billion a month. But Europe and the IMF are demanding that Greece reforms its public sector, and cracks down on tax evasion, as well as adopting a sustainable budget, before it releases the money. “A comprehensive and detailed list of reforms is needed for a successful conclusion, before any disbursement of funds,” said Jeroen Dijsselbloem, the Dutch finance minister and president of the negotiating team Eurogroup. 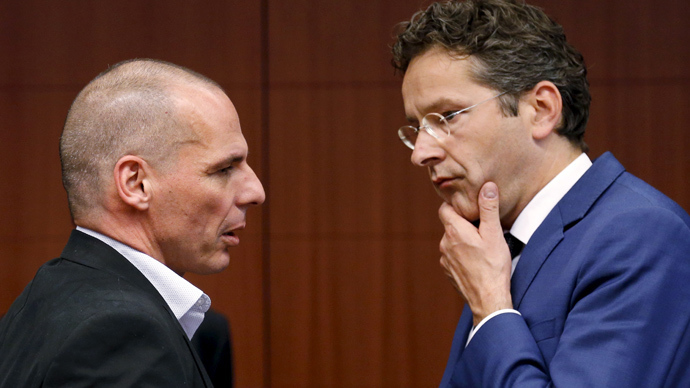 Although the final tranche of Greece’s EU/IMF bailout has not been unlocked, Dijsselbloem said the talks were more productive. “We are making faster progress. I’m not satisfied but just a bit more optimistic, the way the talks take place in the way they negotiate has been improved,” said the minister at a press briefing after the negotiations. Varoufakis failed to address European criticisms of a lack of detail from Greece about its proposed reforms, saying that the basic program has been ready since February, and claiming that further European loans will be secured. “The quest for an agreement that resolves the five- to six-year-old crisis of the Greek social economy is continuing. Agreement is getting closer, and the institutions, our partners, and representatives of the Greek government are continuing to search for that solution in very good spirits,” said the minister. His superior, the newly elected leftist prime minister Alexis Tsipras, has recently suggested that he might ask for a popular referendum, if Athens faces a potential deal that violates the no-more-austerity promise he made to the voters. But all sides were cool on the idea on Monday, with Varoufakis saying a popular poll is “not something that's on the radar screen” and Dijsselbloem claiming that any referendum would take weeks to organize, giving Greece even less time to get a deal done.